This was our second day in Bikaner and after breakfast, our destination was Fort Junagarh. Before touring the fort, let us dig a bit into the history of Bikaner. 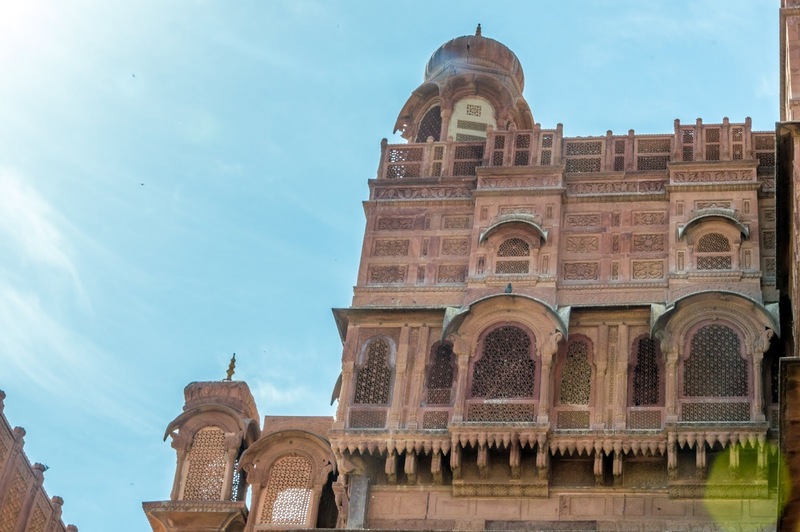 The name Bikaner is associated with Rao Bika. 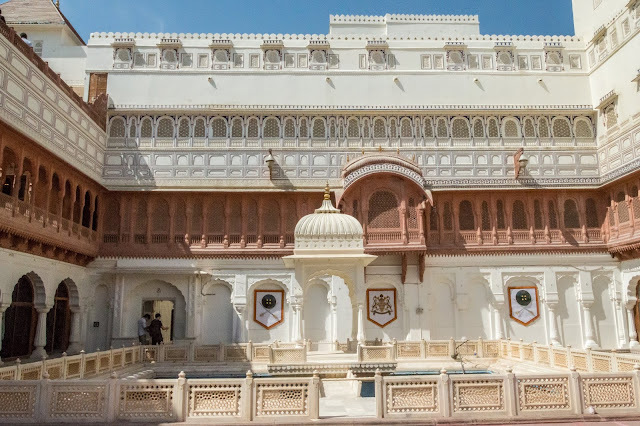 Rao Bika was second son of Rao Jodha the founder of Jodhpur. Being the second son, Rao Bika did not have a chance to become the king of Jodhpur, so he conquered large tracts of lands in Northern Rajasthan to establish his own territory in year 1472, which was called Jangladesh. 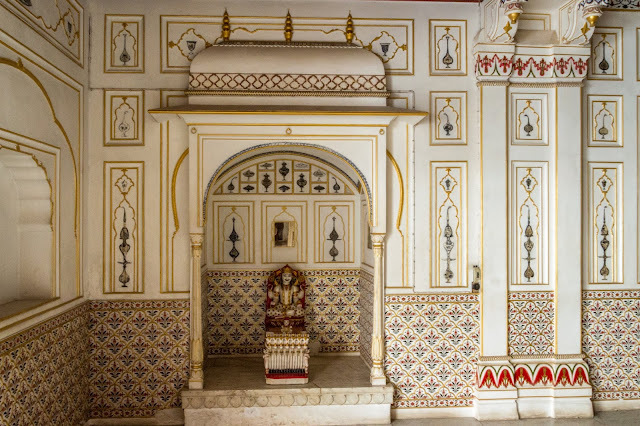 Bikner had a lot of springs inspite of being in Thar desert, so it served a an oasis on trade routes. Later the place came to be known as Bikaner - meaning the residence of Bika. This fort was originally built by Rao Bika in 1478. About 100 years later, when Raja Raj Singh became the ruler, he conducted various campaigns under Suzerainty of Mughal Empire at Delhi. 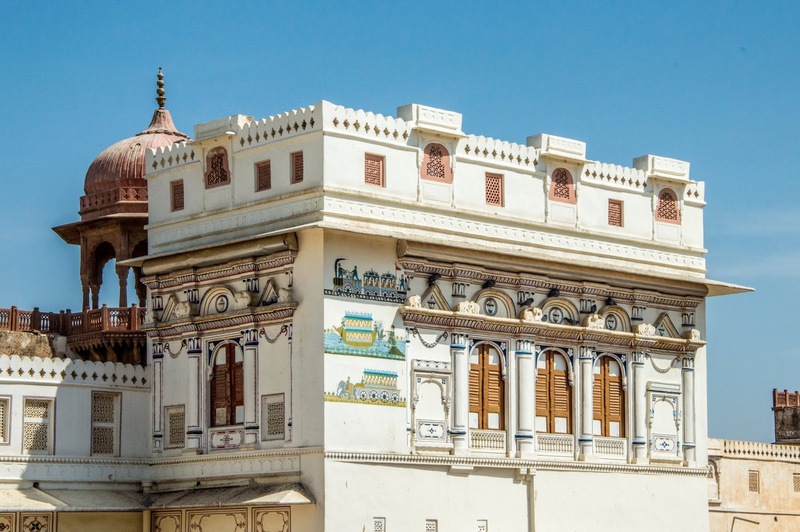 During this period The fortunes of Bikaner Flourished, and the present fort was built. 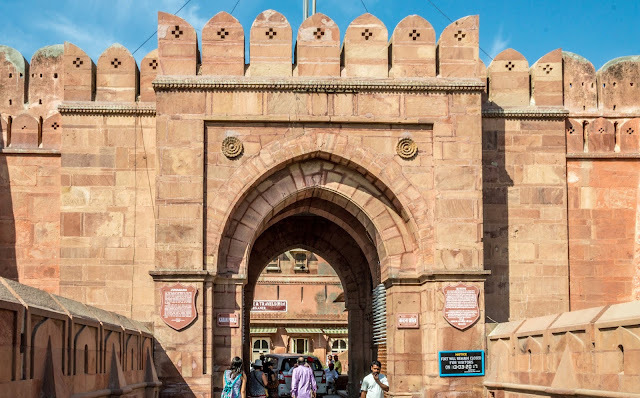 This fort has a periphery of more than one Kilometre and is among very few forts built on ground and not on a hill. 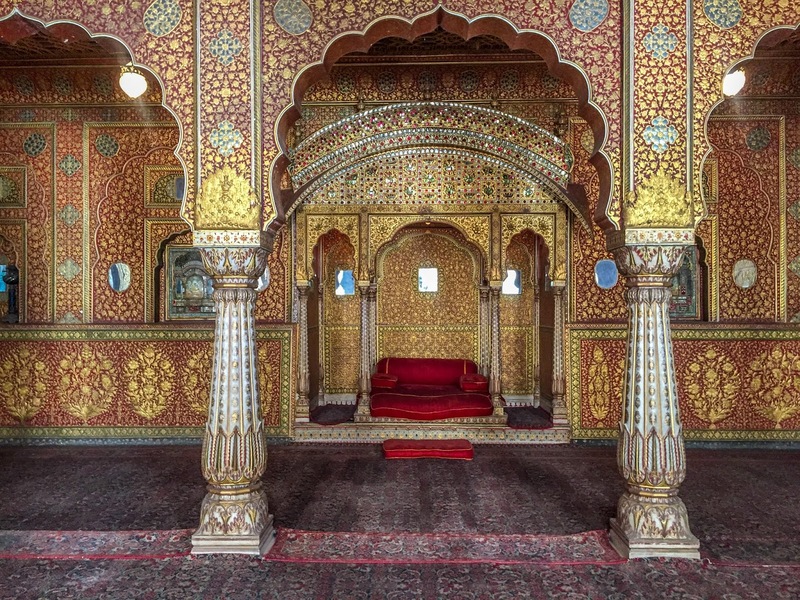 Bikaner is house to a special kind of painting form using gold colour and foil along with other colours and is known as Usta Art. 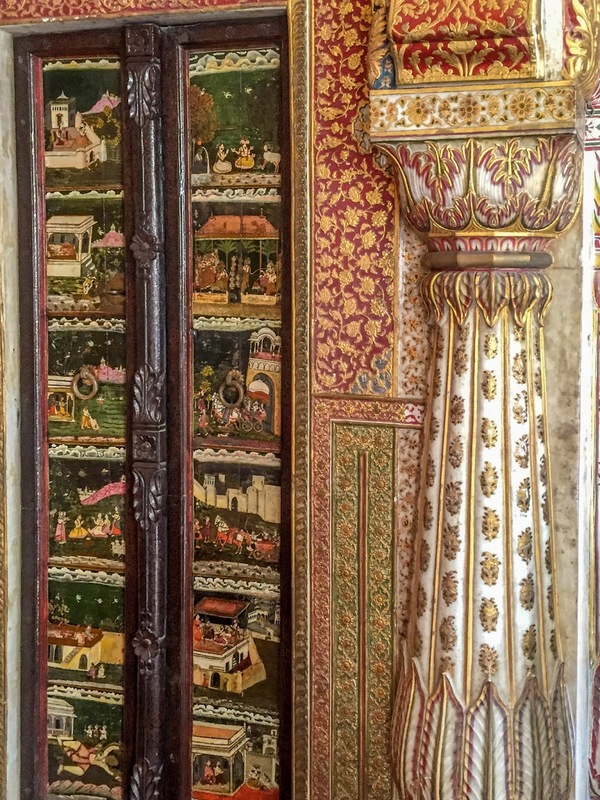 During on of the campaigms to Deccan, the raja was presented gift, among them was a painting by local artist of a gold pillar, which gave the impression of the pillar having been made of solid gold. The artisan was from Jaisalmer, who had migrated to south. He was taken into royal patronage and so this Usta art flourished. 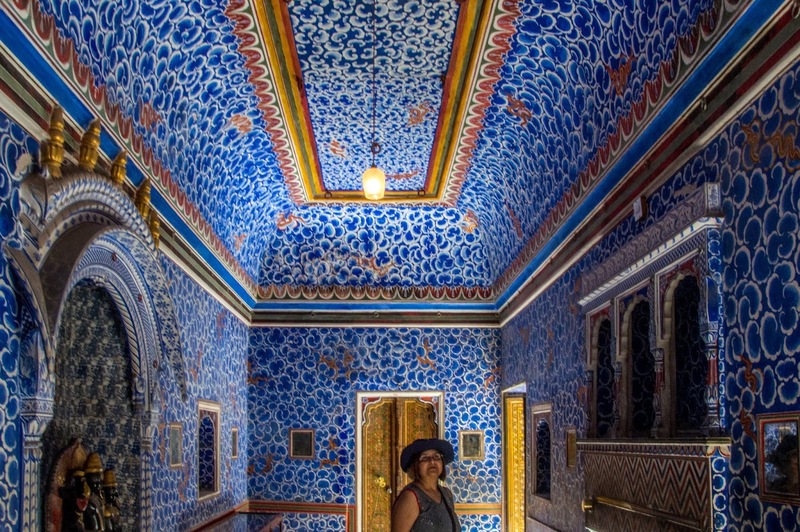 This is used extensively in palaces and forts of Bikaner. More of history, when we tour the fort. After buying tickets, we entered the the fort, through Karan Prole or Pole ( Prole in Rajasthan means Gate ) As we enter the gates, we find hand prints of the Satis on the wall. 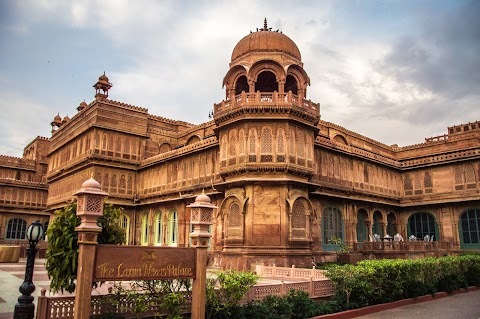 Then come Daulat Prole and after that and as we cross it beautiful buildings in sandstone with intricate carving and Jarokhas welcome you. After that we reached the reception area. Here the tickets are checked a guide accompanies after the group size become 10-15. After some time we reach a courtyard which is a beautiful amalgmation of marble and Sand stone. 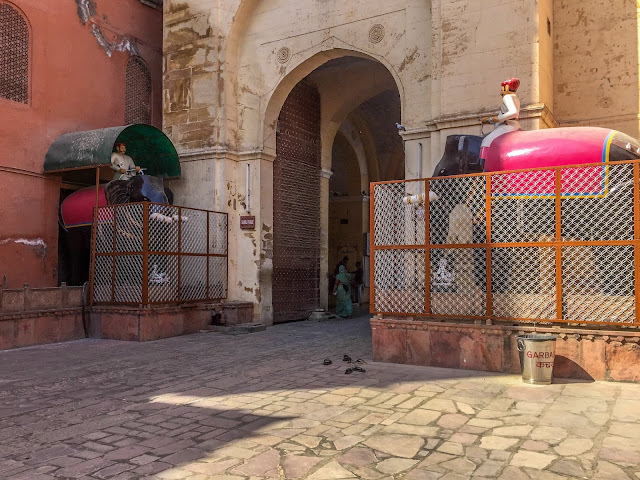 We reach a courtyard which has a chattri in the middle and a small pool like structure around it. It must be some water chanel and the place might have been used by the royalty to beat the heat. The Jali work in both sand stone and marble is beautiful and the Jharokha just behind the Chhatri is very imposing. 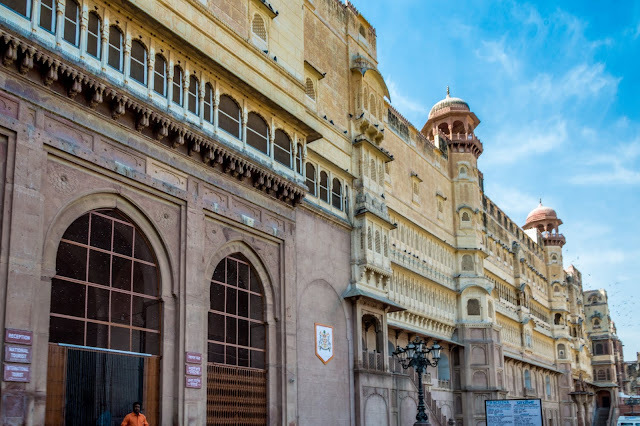 Beneath it the seal of the state of Bikaner adds a different prespective to it. 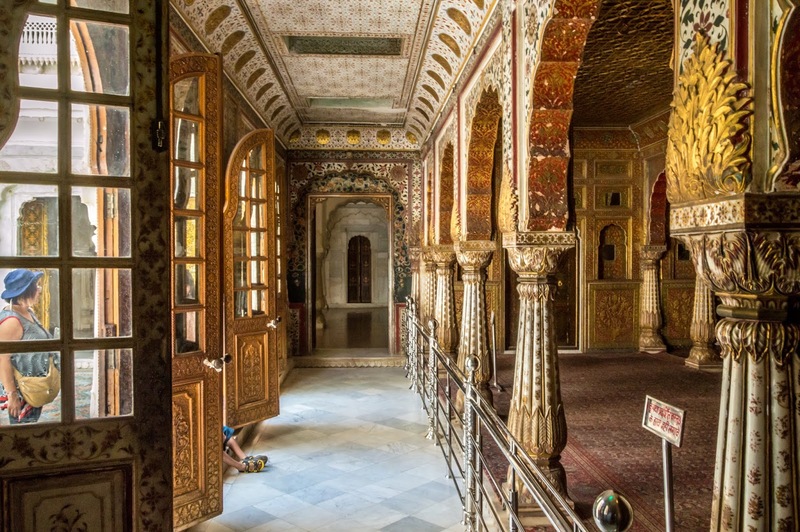 This part of the Palace is known as Karan Mahal. In this courtyard is visible a painting on the top of a wall depicting a train, a boat and and elephant. This indicates the First train line brought to Bikaner from Jodhpur, The boat and the waterway represents the canal brought to Bikanerfrom Punjab and the Elephant indicates power and represents the Electricity that came Bikaner in 1914 due to these a lot of prosperity came to Bikaner. 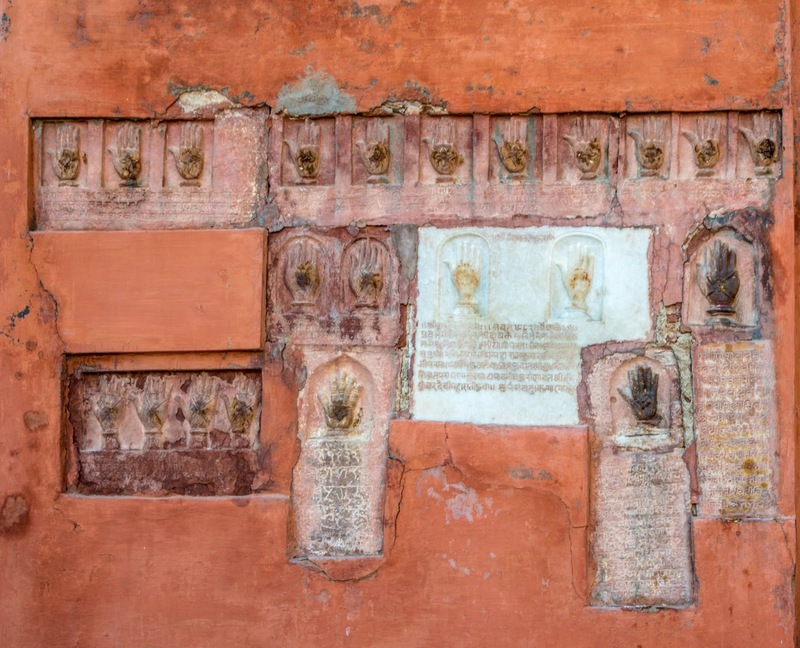 This all happened during the period of Raja Ganga Singh ji, who ruled this state for the longest period. Courtyard having three palaces on three sides. 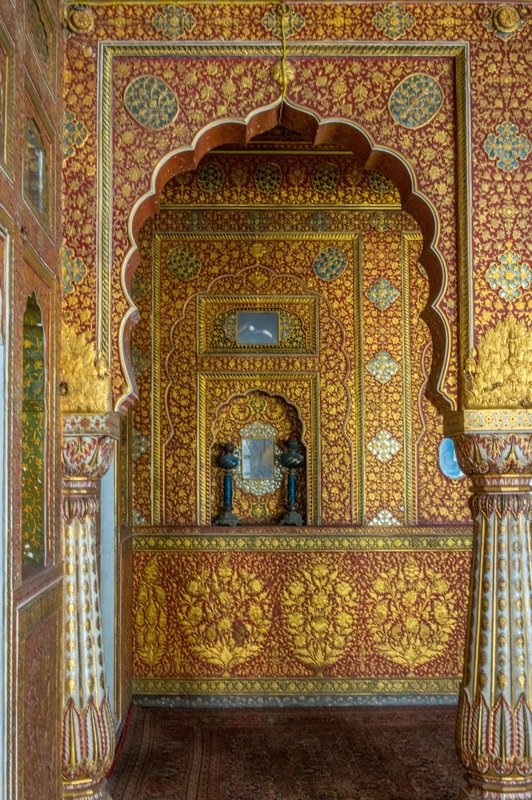 The different styles and decoration of Jharokhas on both the sides indicates they were made during different times. 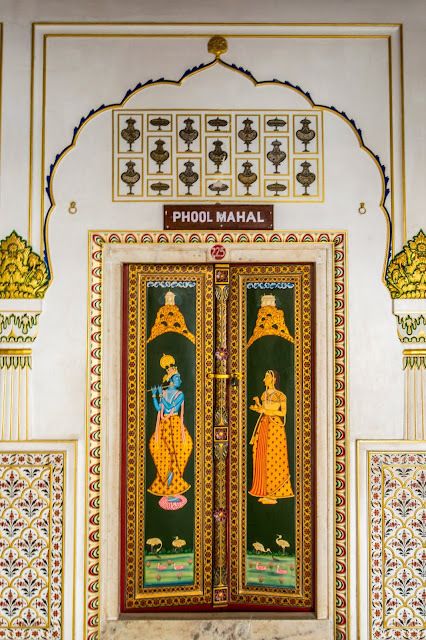 Phool Mahal - This is one of the oldest palaces here and built by Raja Rai Singh ji for some Queen. It houses a lot of artifacts and is in predominantly white colour. 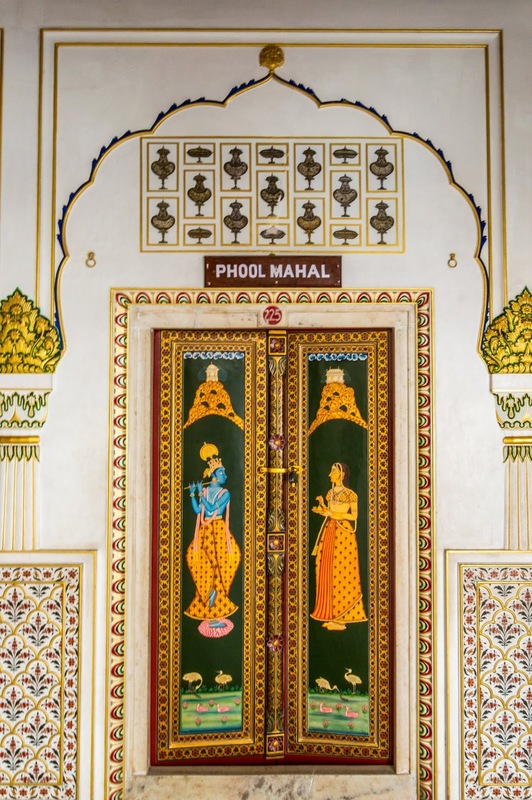 The door of Phool Mahal was a beautifully painted one with Paintings of Radha and Krishan. 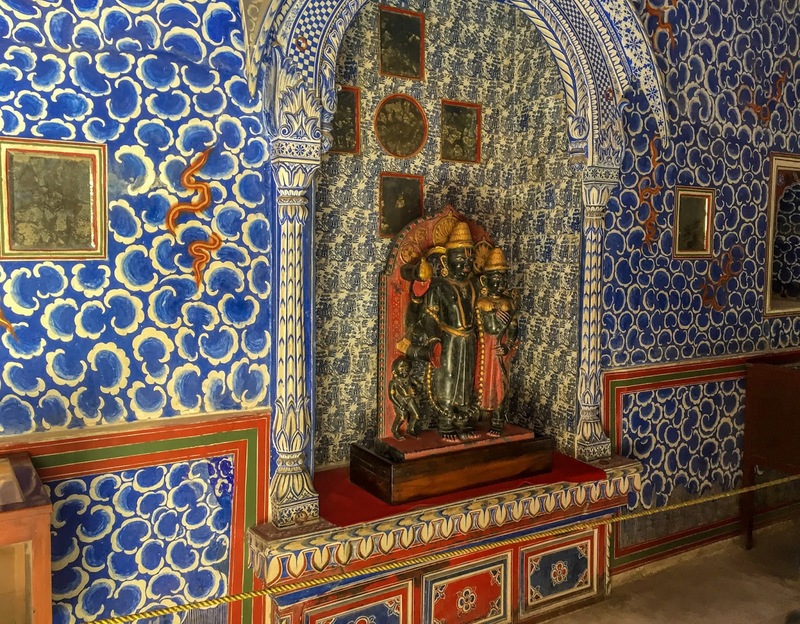 The walls and pillars around also were painted in Gold. 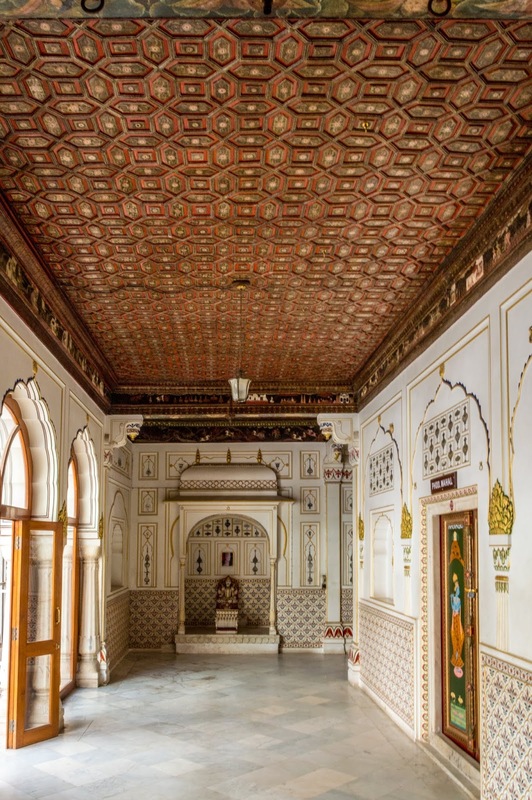 The roof of the corridor was made of Burma teak and very beautifully Painted. It looked so rich. 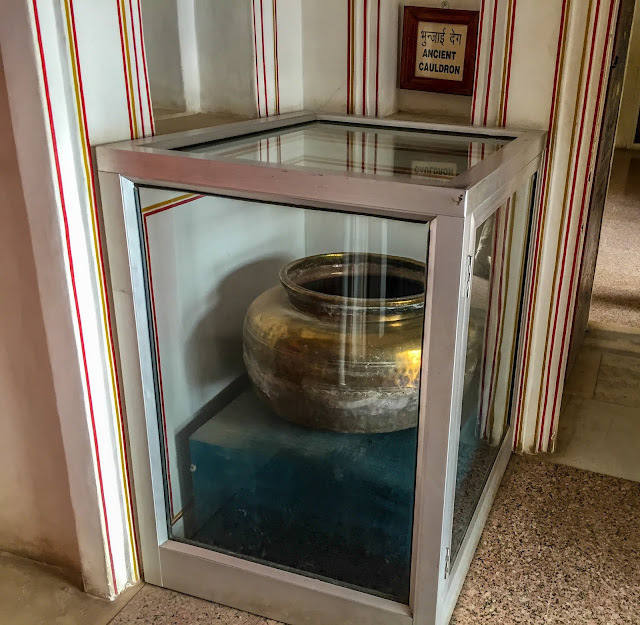 The far end had a small Pooja Ghar, with some Deity installed in it. here is a closer view of the temple. If you see the same paintings as were there in our suite at Laxmi Niwas Palace ( Read here) . Here I struck a jackpot. I saw a person vanishing behind a door and closing it. Just as he was shutting the door I just out of curiosity asked him what was inside. After a bit of Maska polish he allowed us inside. 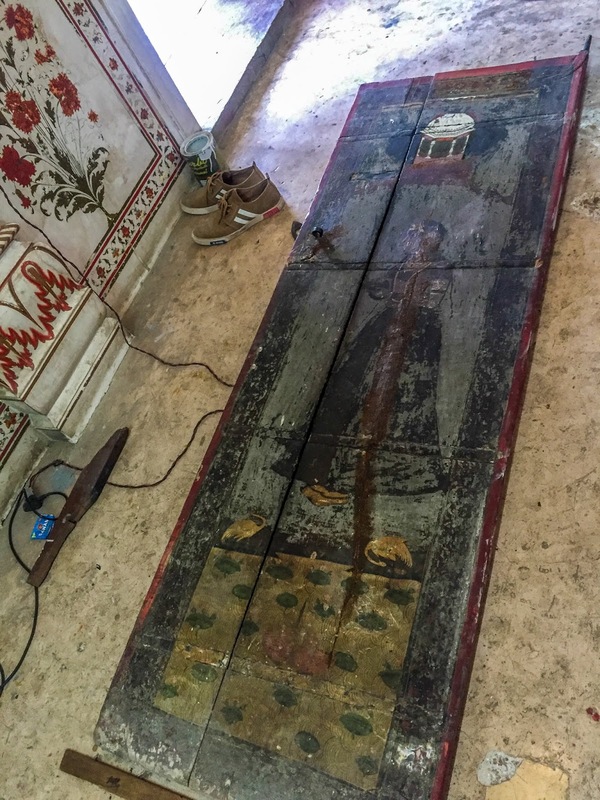 Wow here the restoration of the doors was going on. 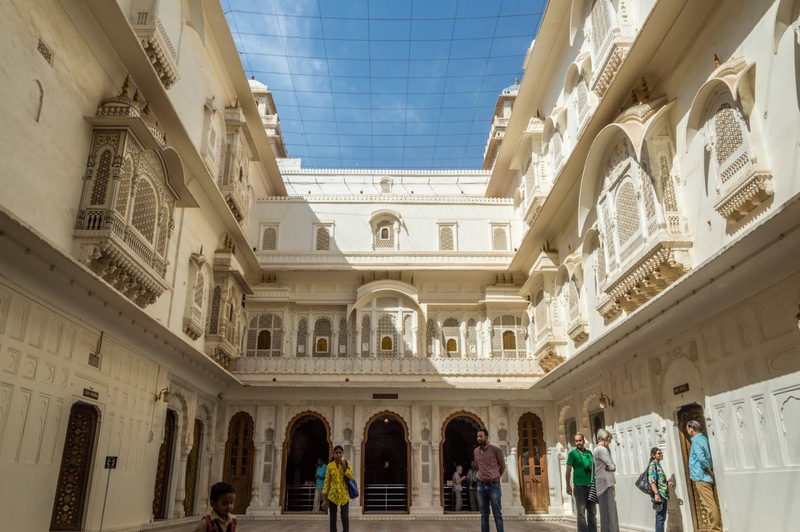 Anup Mahal - This is one of the most ornate palaces. The walls are beautifully painted in red and gold. 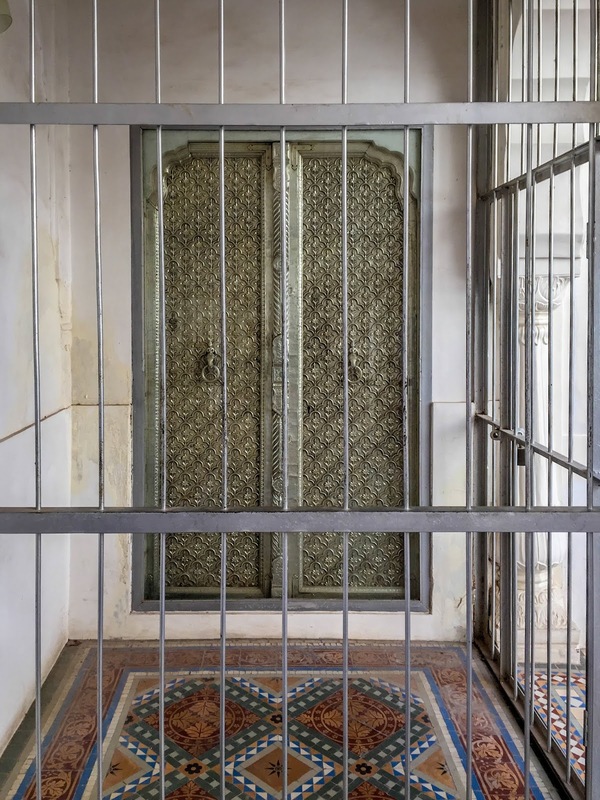 This is akin to Diwan - E - Khas and was used for private meetings. 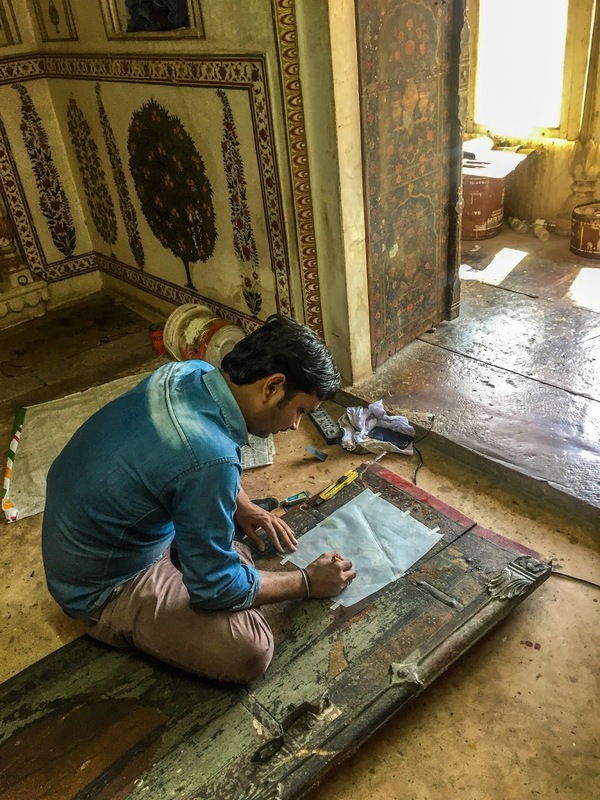 All the carpets are original and are maintained very well. There is a lot of mirror work, which used to increase the illumination due to multiple reflections. Oh My God so much of Opulance. We can also see old lamps in Jharokhas. Beautifully painted door and pillar. Another view of the grandure of this palace. 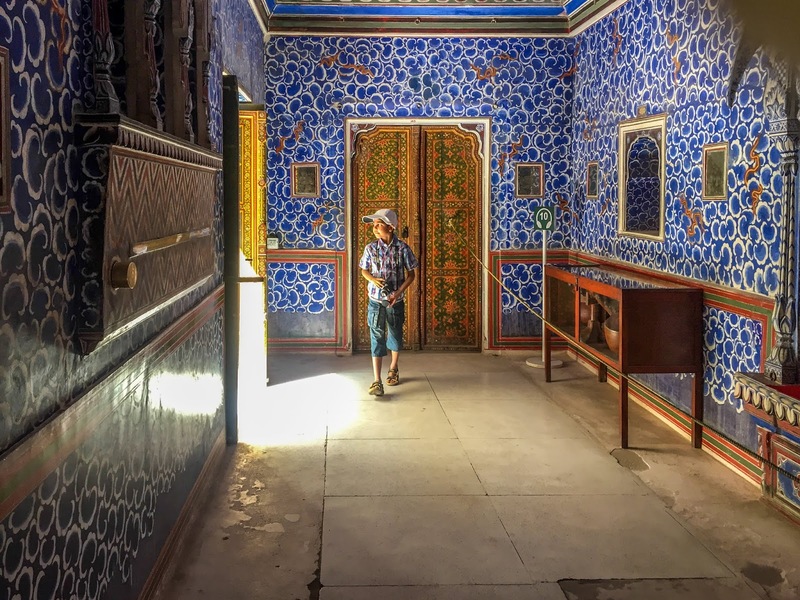 Badal Mahal - Badal Mahal is a beautiful palace, ( here Mahal does not refer to a palace spread over vast tract, but a small suite kindo thing). This has clouds painted all over. On the left hand wall in above photo, the small protruding section is a part of cooling mechanism. It has a water tank in its back. The long strip kind of thins alongwith round button is where the whole system operated. The long strip was a metallic mechnism with a very fine slit in it. From which came out a spray of fine water vapours. This spray of vapours cooled the room, when fans were oprated. This also houses a beautiful idol of Ram Chander ji and Sita ji. 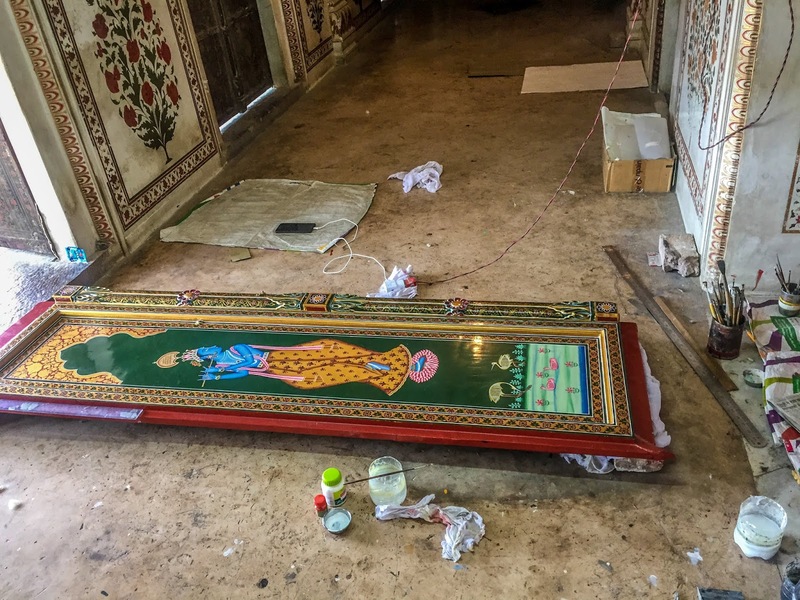 A beautiful veena is also kept in an enclosure here. I failed to understand the presence of these two. 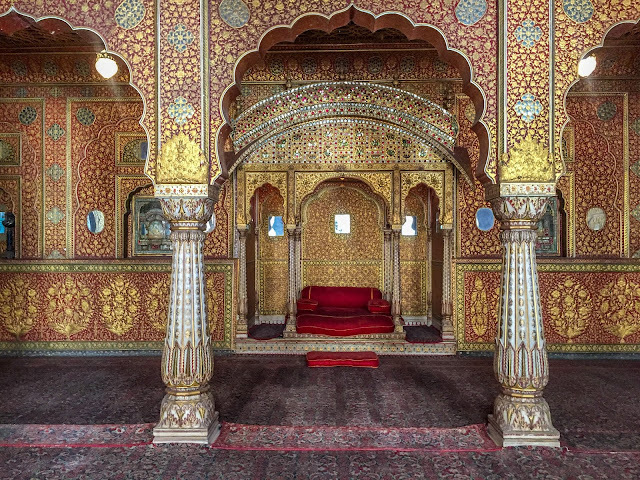 Maybe royalty used to listen to music here or indulge in Bhajan Kirtan here.